I saw this book at ALA this year in New Orleans but sadily I could not have a copy becuase I have yet to finish my degree to become a librarian. So now I am counting down the days that I can get my hands on this one. So today I am here to share with you a little about the title. Let us know in the comments below how much you want to grabby hands this one! Love. Magic. 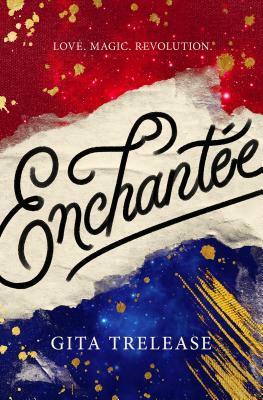 Revolution...Enchantée is Gita Trelease’s imaginative debut fantasy about an impoverished magician desperate to provide for her beloved sister on the eve of the French Revolution. When smallpox kills her parents, seventeen-year-old Camille Durbonne must find a way to provide for her frail sister while managing her volatile brother. Relying on petty magic--la magie ordinaire--Camille painstakingly transforms scraps of metal into money to buy the food and medicine they need. But when the coins won't hold their shape and her brother disappears with the family's savings, Camille must pursue a richer, more dangerous mark: the glittering court of Louis XVI and Marie Antoinette. With the dark magic she learned from her mother, Camille transforms herself into 'the Baroness de la Fontaine' and is swept up into life at the Palace of Versailles, where aristocrats both fear and hunger for la magie. Her resentment of the rich at odds with the allure of glamour and excess, Camille is astonished to find that her would-be suitor Lazare, a handsome young inventor whom she thought shared her dreams of liberty, is also living a double life. As the Baroness de la Fontaine, Camille gambles at cards and flirts, desperate to maintain her place at court and keep herself and her sister off the streets. But la magie has its costs. When a scheming courtier blackmails her and Lazare's affections shift, Camille loses control of her secrets. Then revolution erupts, and she must choose--love or loyalty, democracy or aristocracy, reality or la magie--before Paris burns. About the Author: Born in Sweden to Indian and Swedish parents, Gita Trelease has lived in many places, including New York, Paris, and a tiny town in central Italy. She attended Yale College and New York University, where she earned a Ph.D. in British literature. Before becoming a novelist, she taught classes on writing and fairy tales. Along with her husband and son, Gita divides her time between a village in Massachusetts and the coast of Maine. Enchantée is her debut novel.